The fall armyworms that have ravaged corn fields from Ghana to South Africa since arriving on the continent last year could even colonize Asia and the Mediterranean. These prolific breeders march in formations and eat everything in an area, and once the food supply is exhausted, the entire "army" moves to the next available food source. The armyworm poses a major threat to food security and agricultural trade of Africa. 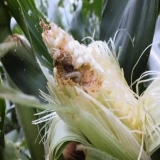 The fall armyworm's presence has now been confirmed in west Africa and is thought to be present in the south and east of the continent, many parts of which rely on maize for their staple diet. 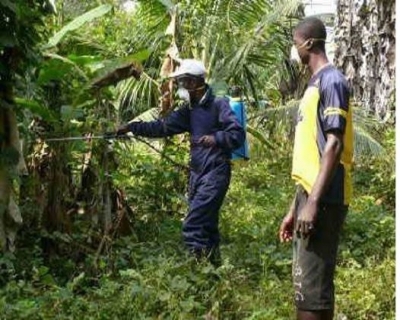 Infestations of the pest that arrived from the Americas last year have been confirmed in Ghana, the Oxfordshire, U.K.-based Centre for Agriculture and Biosciences International (CABI) said. 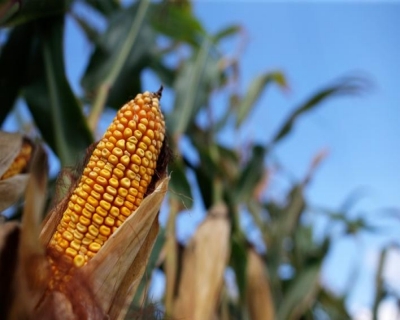 South Africa also verified on Feb. 3 that the caterpillars have arrived in the continent’s biggest producer of corn, a staple, after they traveled from Zambia through Zimbabwe. 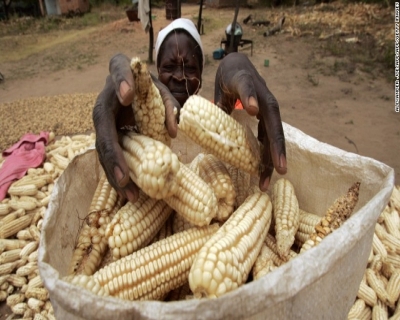 There are reports that they have also reached Malawi, Mozambique and Namibia, according to the Food and Agriculture Organization (FAO) of the United Nations. “It can be expected to spread to the limits of suitable African habitat within a few years,” the organization said in an e-mailed statement. The fall armyworm could spread to tropical Asia and the Mediterranean in the next few years, becoming a major threat to agricultural trade worldwide. 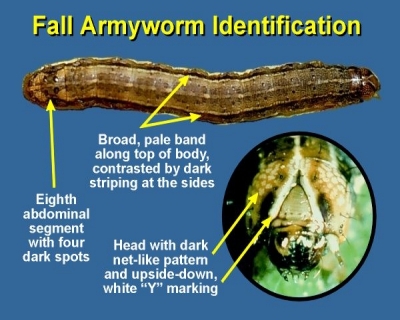 The fall armyworms, that get their name from the large numbers that invade fields and eat the leaves and stems, are probably more dangerous than the native African armyworm, and their introduction will pose a lasting threat to crops on the continent. 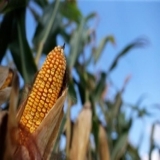 The pest can devastate corn fields, risking production of the staple food in a region that’s emerging from its worst drought in more than 35 years. The pest is known to cause extensive crop losses of up to 73 percent depending on existing conditions and is difficult to control with a single type of pesticide. 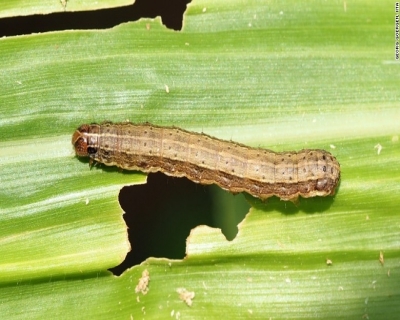 The FAO is to hold an emergency meeting in Harare between 14 and 16 February to decide emergency responses to the armyworm threat. Experts at CABI say it could take several years to develop effective methods to control the pest. Why is this bad news for Africa? A fall armyworm outbreak, the first emergence of the pest in southern Africa, is sure to cause considerable crop damage in some countries. If the pest damage aggravates, it could dampen prospects for good crop harvests that is anticipated in the current farming season. Maize, a staple food in the region has been the most affected, as well as other cereals including sorghum, millet, and wheat. Southern Africa is reeling from the effects of two consecutive years of El Nino-induced drought that affected over 40 million people, reduced food availability by 15 percent and caused a cereal deficit of 9 million tons. The region is also currently facing serious threats posed by diverse transboundary pests and diseases, including the varied armyworms, locusts, the tomato leaf minor and maize lethal necrosis disease. The Highly Pathogenic Avian Influenza (also known as bird flu), H5N8 strain, that has been confirmed to be in Uganda and possibly Rwanda too, is likely to spread southwards, along the wild bird migration routes. As the region faces up to these new and emerging challenges, that are threatening the livelihoods of over 70 percent of the population that depend on agriculture, there is a crucial need to enhance capacity at country and regional levels, to prevent, detect and respond rapidly to any new pests and diseases threat. “The countries need to maintain and, where needed, expand diagnostic laboratory, surveillance and response capacity as well as conduct assessments and research to enable rapid responses to recurrent and new threats”, said David Phiri, the FAO Subregional Coordinator for southern Africa. 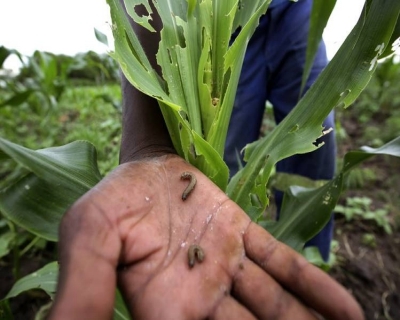 FAO is working with governments, the Southern African Development Community (SADC) and other stakeholders to develop and roll out an appropriate strategy to determine the level of fall armyworm infestation and its impact on crop production. Note: El Nino is an irregularly periodical variation in winds and sea surface temperatures over the tropical eastern Pacific Ocean, affecting much of the tropics and subtropics. When did the army land in Africa? Since late last year, armyworms — so called because they march in large formations and leave behind destruction — have invaded a third of Zambia’s 3.5 million acres of cornfields. This pest is originally native to South and Central America and also occurs in the southern states of the US and uses wind currents to travel long distances as it’s a real good flier. 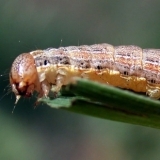 Scientists believe the fall armyworms crossed the Atlantic on container ships ferrying grain imports from South America. They were first detected in West Africa last year, before making their way south, the Zambia Farmers Union said. This is the first time the Fall Armyworm has hit South African soil after it was first spotted in Nigeria a year ago. Once established in an area, the adult moths can fly large distances and spread rapidly. It takes soldiers to fight an army. The war between humans and pests is on. Soldiers toting pesticide pumps in backpacks are working to eradicate a recent invasion of armyworms. Air power is involved too. Above, troops flying Chinese Harbin attack helicopters are airdropping supplies of pesticide to farms whose corn crops are being devoured. Right now, the great army of fall worms seems unstoppable. Where has the worm already begun its carnage? Outbreaks were first reported in West and Central Africa at the beginning of last year. They have since jumped the Equator into Burundi, Zambia, Zimbabwe and Malawi and have spread to some of the northern areas of South Africa. Zimbabwe is currently the worst affected country. FAO reports that armyworms are present in seven of the country's eight provinces, with estimates of 70% crop destruction in some areas. The Zimbabwean government is circulating information and pesticides among farmers to help them combat the threat, but faces a long struggle to turn back the tide. Neighboring Zambia has taken drastic measures to halt the march of the armyworm. The Zambia Government has already spent US$ 3 million in an attempt to control the pest that has affected approximately 130 000 hectares of crops. However, the full extent of the damage in the country and other affected countries is yet to be established. For copper-producing Zambia, the stakes are really high. Corn prices are the leading driver of inflation, upon which miners unions peg wage demands. Strikes have erupted at several copper mines since the outbreak, threatening output from Africa’s second-biggest miner of the industrial metal. 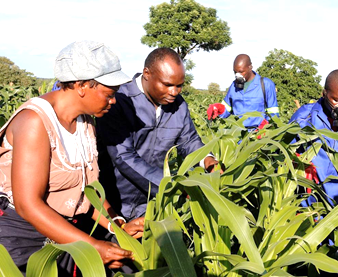 Outbreaks of different strains of armyworm have also been reported in Namibia and Malawi - where the government recently reported the destruction of 2,000 hectares of maize. Who are these soldiers of destruction? This destructive garden pest, armyworm, gets its name because it travels in small insect armies and consumes just about everything in its path. There’s a number of species of armyworm caterpillars, many with a distinct taste for a particular plant or vegetable. But some will eat anything green or red or yellow. They are most active at night and hide in plants and under garden debris during the day. In their larval stage, army worms attack a variety of crops as well as grasses, sometime moving en masse to new areas in a way that brings to mind, as its name suggests, an army on the march. The assault is mostly aerial, with the gray moths usually arriving under cover of darkness to lay eggs. The biggest invasion of army worms usually occurs after a cool, wet spring. Armyworms are prolific and responsive to favorable conditions. Their eggs are laid in fluffy masses on crowns of seedlings and on leaves of older plants. In 5-10 days tiny caterpillars hatch and feed for several weeks. They then pupate and emerge as adults 10 days later. They are ready to breed now. The army is about to gain new soldiers. How can this army be fought? If the farmers don’t suffer armyworm outbreaks, then they can thank its natural predators, including birds, beneficial insects, and other larvae predators. If pest numbers are high, it suggests these natural predators have been done in by the very pesticides applied to kill the army worms. So, to manage armyworms farmers avoid using harmful pesticides or practices that would inadvertently destroy beneficial insects, the first line of natural defense. When farmers first notice them they should look for the distinctive white dot on their forewings and start closer inspection of the plants. Next, they should look for larvae and signs of damage beginning in early spring. Caterpillars will often be found feeding on the undersides of leaves and on new growth. The discovered worms should be handpicked and eliminated by using soapy water. Releasing trichogramma wasps can parasitize any newly laid eggs. These tiny beneficial insects — 1mm or less — insert their eggs inside of pest eggs, killing them before they enter the plant-eating larval stage. Other beneficial insects, such as lacewing, ladybugs and minute pirate bugs feed on armyworm eggs as well as the young larval stage. Beneficial insects help control other harmful pests, including aphids, earworms, cutworms, cabbage loopers, a variety of mite and insect eggs. Plants can be grown to attract birds and beneficial insects. Birds are especially fond of the moths and will pull larvae from lawns and plants. In the fall, the soil should be turned and uncovered before putting it to bed, giving birds a chance to pick off the exposed pupae. Spray and pray when the armyworms attack.